Just because its good for you doesnt mean it has to break the bank. Whether its a party for friends, midweek supper or dessert to share. Ellie shares her budget-busting recipes to suit any occasion. Salmon cakes with creamy ginger sauce, Asian-style three-bean salad, penne with roasted tomatoes, garlic and white beans, and a pear crumble. Delicious healthy recipes that work on any budget. 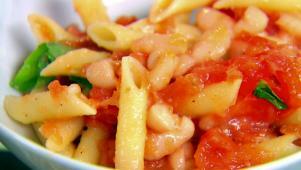 Ellie's penne and tomatoes is a quick, healthy meal any night of the week.